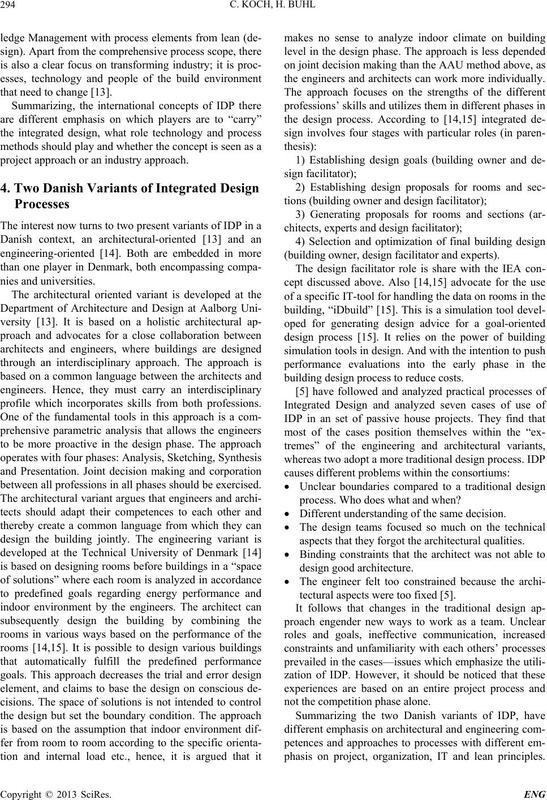 Consulting Engin eers and Architects are cu rrently exp erimen ting with the concep t of “Integ rated Design Process” (IDP). reach a higher standard and quality and are integrated earlier in the design process. sions of greenhouse gases by 60% to 80% by 2050 .
management concept rather than merely mimicking it. given to Danish contributors, identifying three variants. EU- requirements for energy consumption. “Green Building” and “Lo w Energy Building”. traditional power operated convectors in heating . that need to change . project approach or an industry approach. profile which incorporates skills from both professions. between all professions in all phases should be exercised. 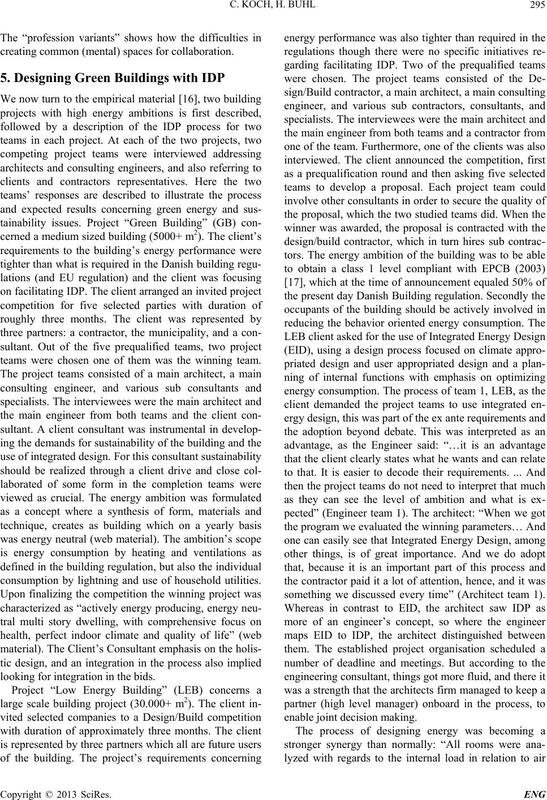 the engineers and architects can work more individually. (building owner, design facilitator and experts). building design process to reduce costs. process. W ho does what and when?  Different understanding of the same decision. aspects that they forgot the architectural qualities. tectural aspects were too fixed . not the competition phase alone. phasis on project, organization, IT and lean principles. creating common (mental) spaces for collaboration. teams were chosen one of them was the winning team. consumption by lightning and use of household utilities. looking for integration in th e bids. something we discussed every time” (Architect team 1). enable joint de ci si on m a ki ng . need to calculate/compute the different solutions/ideas. the proposa l d i d not win. out of that” (Consulting Engineer). emphasis on joint workshops with many participants. given design criteria; including (other) user requirements. design and balancing it with other criteria such as cost. solutions were perceived as too easy by the engineers. ited roof space compared to the size of the building. 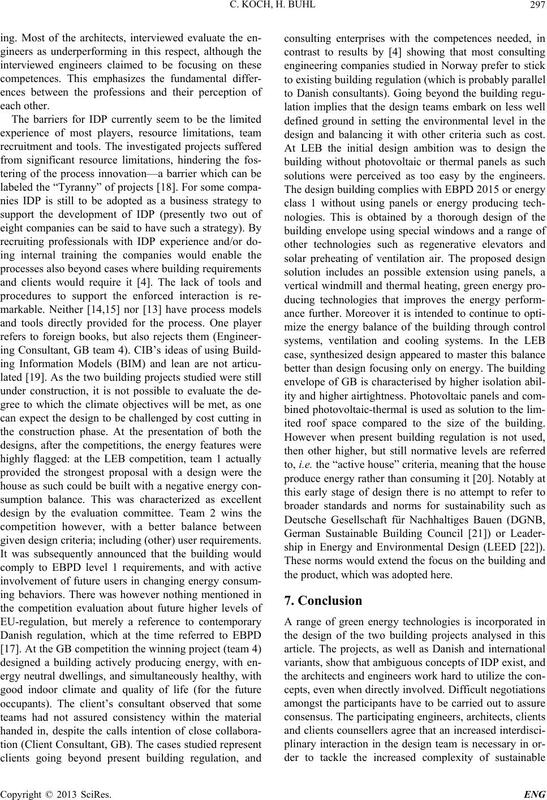 ship in Energy and Environmental Design (LEED ). the product, whic h was adopted here. issues hopefully would be overcome in the future. 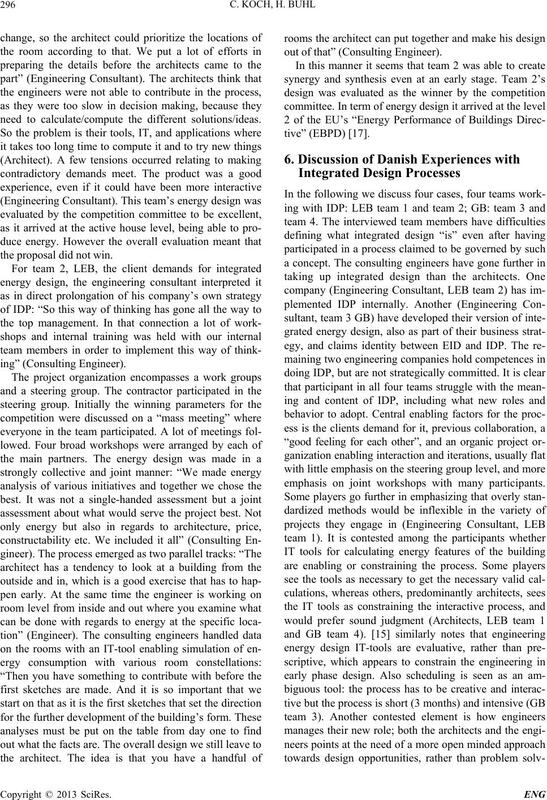 Collins Business, New York, 2008.
ies, Vol. 3, No. 2, 2011, pp. 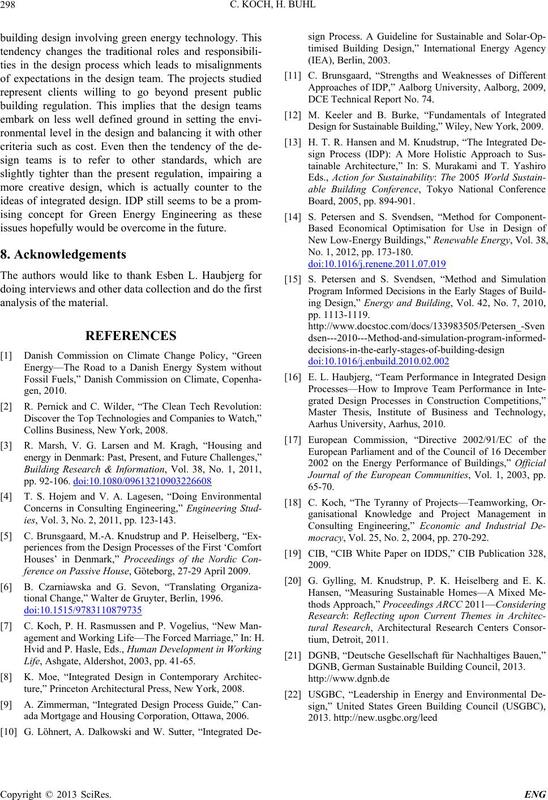 123-143.
ference on Passive House, Göteborg, 27-29 April 2009.
tional Change,” Walter de Gruyter, Berlin, 1996.
agement and Working Life—The Forced Marriage,” In: H.
Life, Ashgate, Aldershot, 2003, pp. 41-65.
ture,” Princeton Architectural Press, New York, 2008.
ada Mortgage and Housing Corporation, Ottawa, 2006. 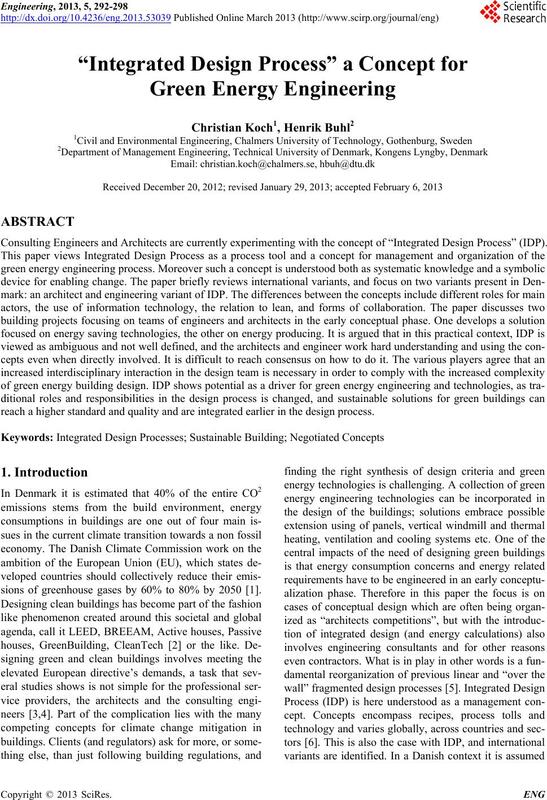 DCE Technical Report No. 74. Desig n f o r S u sta i n a b l e Bui l ding , ” W ile y, N e w York , 2009. No. 1, 2012, pp. 173-180. Journal of the European Communities, Vol. 1, 2003, pp. mocracy, Vol. 25, No. 2, 2004, pp. 270-292. 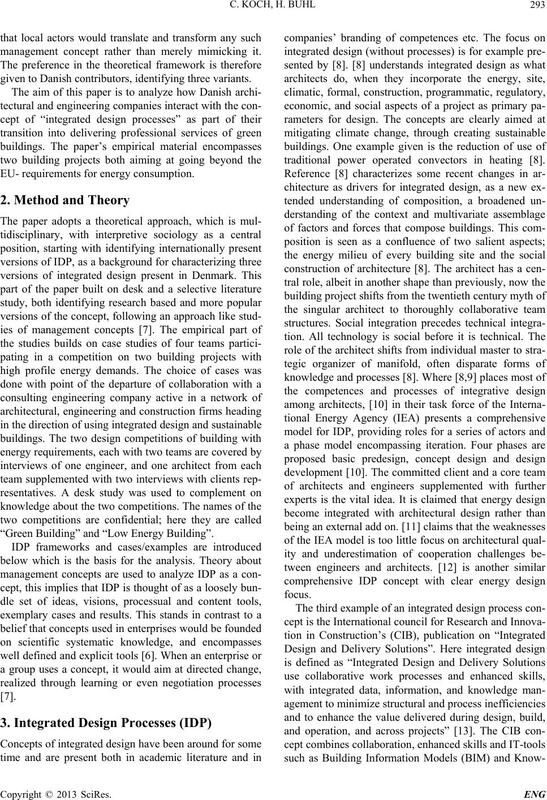 G. Gylling, M. Knudstrup, P. K. Heiselberg and E. K.
DGNB, German Sustainable Building Council, 2013.